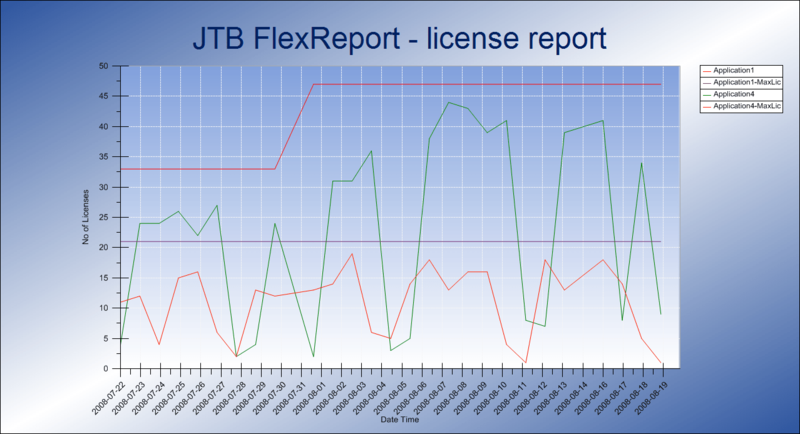 JTB FlexReport LT is a freeware app from JTB World to create HTML reports on current usage of FlexNet/FLEXlm licenses. Note that Expand, Collapse, Show, Hide and other places can be clicked on to make it easier to view and navigate the report. JTB_FlexReport_LT_1_8_no_installation.zip (3.0 MB) version 1.8 - portable download with the possibility to get the files without the need run the installation. JTB_FlexReport_LT_1_8_setup.zip (2.5 MB) version 1.8 - Windows installer version. 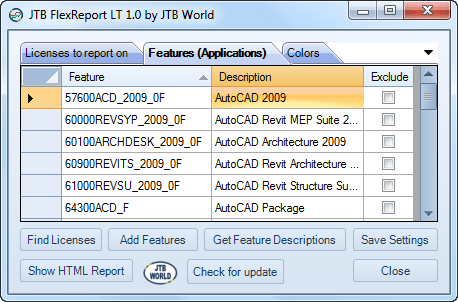 Installer to have JTB FlexReport LT as AutoCAD app is found at the Autodesk App Store site and is available for AutoCAD 2015 and newer including verticals. FlexNetFeatures.xml Sometimes "Get Feature Descriptions" can be blocked to download the feature description list due to firewall or other security restrictions. 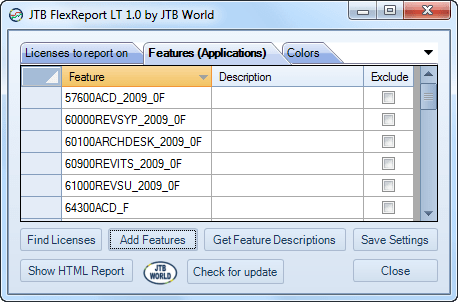 Right-click on the FlexNetFeatures.xml link and save it in the JTB FlexReport LT installation folder. See also the FlexNet Feature Codes page. .Net Framework 4.6.1 or newer is required. Operating system - Windows 10, Windows 8.1, Windows 8, Windows 7, Windows Vista, Windows Server 2016, Windows Server 2012 R2, Windows Server 2012, Windows Server 2008 R2, Windows 2008 Server. 32-bit and 64-bit operating systems are supported. 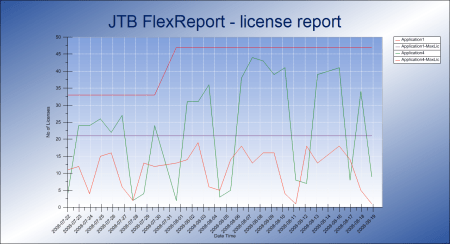 FLEXlm or FlexNet running on other operating systems like Mac OS X, UNIX or Linux can be reported usage on but JTB FlexReport LT must run on a Windows OS. Support is not guaranteed as this is a freeware but we will try to give support anyway whenever possible. To install extract the zip file to a new empty folder on your computer, network or USB memory. AutoCAD 2012 and 2012 verticals and newer installations are supporting the autoloader. This can be done both while AutoCAD is running or not running. 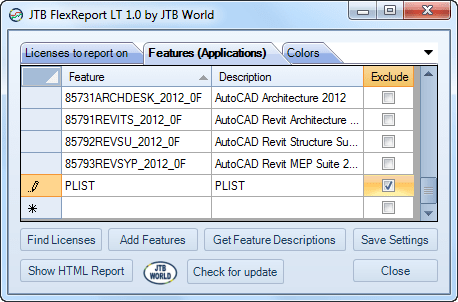 The command JTBFlexReportLTStartup in AutoCAD can be used to create shortcuts on Windows Menu>All Programs>JTB FlexReport LT.
1. 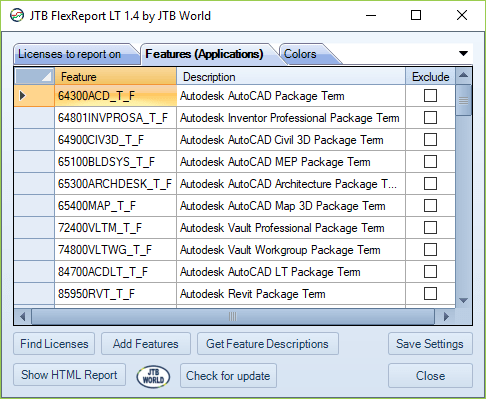 Run JTB FlexReport LT.exe from the installation folder to start the program alternatively "JTB FlexReport LT Configure" or "JTB FlexReport HTML Report" from Windows Start Menu>All Programs or from within AutoCAD on the Plug-ins/Add-ins tab. 2. Click on Find Licenses. 3. Click on Add Features. 4. Optionally click on Get Feature Descriptions. 5. Optionally click on Save Settings. 6. Click on Show HTML Report. Note that Expand, Collapse, Show, Hide and other places can be clicked on to make it easier to view and navigate the HTML report. In an ideal world the Find Licenses button will find the license servers in your network and add to the list of Licenses to report on tab. Sometimes the Find Licenses button finds one or several servers not valid and have to be removed. If unsure show the HTML report first and look for errors. Sometimes the Find Licenses button does not find the server or servers and they have to be added manually. Add the licenses to report on to the License column. Sometimes it can work with the syntax @server but if it does not work the port number has to be used too. Optionally the Description column can be used in the report instead of the License column. Use the checkbox in this column to exclude a license from the report. When settings are saved the file FlexNetServers.ini will be created in the same folder as the executable. Optionally the Description column can be used in the report instead of the Feature column. FlexNet feature descriptions can be retrieved automatically using the Get Feature Descriptions button. Use the checkbox in this column to exclude a feature from the report. When settings are saved the file FlexNetFeatures.ini will be created in the same folder as the executable. 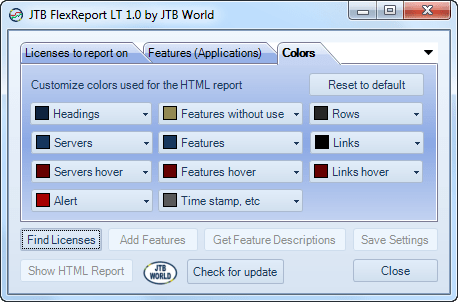 Customize colors used for the HTML report to personalize the look and make it easy to read. Reset to default button will reset the colors to default colors. When settings are saved the colors are saved in the registry. 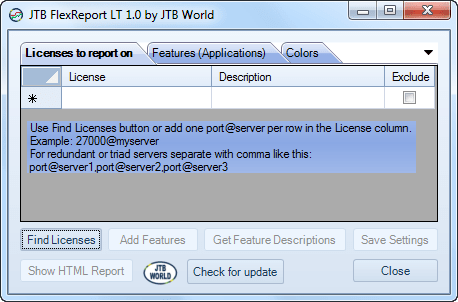 Create a shortcut to JTB FlexReport LT.exe and add /h as argument to create a HTML report with the application form hidden. A scheduled task can be created with Window Task Scheduler to automate this and make the report available for users in an intranet and have it regularly updated automatically. 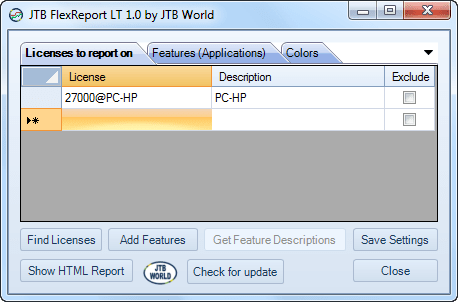 Create a shortcut to JTB FlexReport LT.exe and add /h /o as argument to create a HTML report with the application form hidden and having the HTML report opened in the web browser. 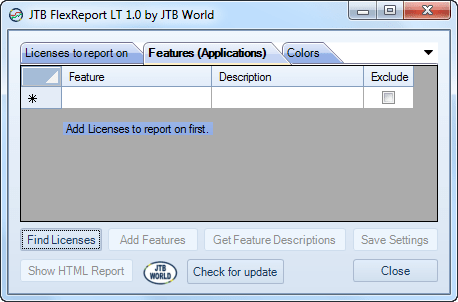 Create a shortcut to JTB FlexReport LT.exe and add a full path and name of the HTML report. If not there the HTML report will be created in the %TEMP% folder. If the path and/or name contains spaces use double quotes around it. Can be combined with the /h and /o arguments. Example: "D:\JTBFlexReportLT\JTB FlexReport LT.exe" "D:\JTBFlexReportLT\Flex Usage.htm"
Create an application folder on the network in a folder available for others and place the files in it. Optionally configure servers and features, save settings and then make the .ini files read-only or have the whole folder read-only for the users. Creature two or more copies of the application folder and have different features to report on for the different folders. If "Add Features" button does not add any features one reason could be a mismatch of FlexNet versions. If so, what you can try is take the lmutil.exe from your license server and copy it into the JTB FlexReport LT folder and try again. Autodesk Network License Manager is supported. Fixed problem to use "Get Feature Descriptions"
Fixing problem with running on 32-bit Windows. Fixing random minor issues with startup. Fixing /h command line argument problem making it not always work as expected. New version of lmutil.exe included. Updated installer to support AutoCAD 2015 and verticals. Updated installer to support AutoCAD 2014 and verticals. Updated installer to support AutoCAD 2013 and verticals.